A sinuous salt-glazed stoneware jug made by the 19th-century potters and brothers Wallace and Cornwall Kirkpatrick broke the auction record for a piece of “Anna Pottery”, a celebrated category of American folk ceramics named after the artists’ native Anna, Illinois. The work was sold this week (3 November) to a private American collector on behalf of an undisclosed US museum at the Maryland auction house Crocker Farm for $141,000 (with premium) against an estimate of $50,000 to $70,000. The Kirkpatrick brothers, who have a cult following among folk collectors, launched their foundry in 1859, using the local beds of brown clay and horse-powered clay grinding techniques to create their distinctive stoneware. Over five decades, the Kirkpatricks created a vast range of pieces including fruit jars, urns, buckets, stems for tobacco pipes and other objects, but were best known for their eccentric one-of-a-kind designs such as this complex snake jug. Anna Pottery closed in 1910, around the same time that modern tin and glass containers were commercially popularised. There has been an uptick in the market for such works, although this piece “supersedes any one category—it’s head and shoulders above what folk pottery collectors seek out, whether or not they generally tend to stick to one particular region or style”, says the auction house’s owner, Anthony Zipp. He adds, “American folk pottery in general is doing very well and institution participation has increased dramatically, but for this piece there was a big buzz, with six or seven phone lines going”. The ovoid wheel-thrown jug was made in 1877. The work satirically references the biblical association of the snake and the dangers of alcohol as well as Wallace Kirkpatrick’s own hobby of collecting pet snakes, which he showed alongside pottery in fairs across the US to lure customers. The work traded hands privately for decades before landing in 1991 at Rago Auctions in Lambertville, New Jersey, where it was acquired by this week’s consignor. 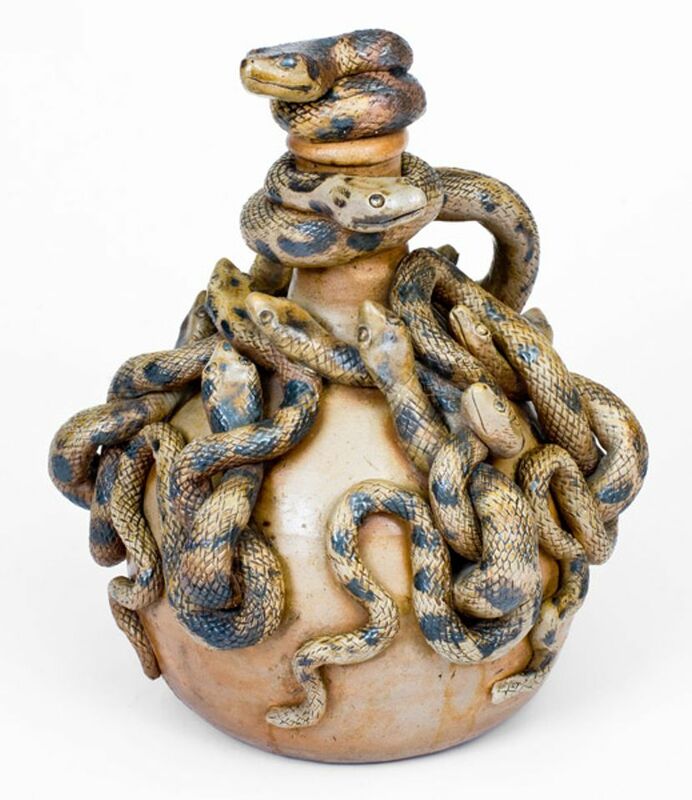 This jug retains its original stopper but some of the snakes have been restored, which auctioneers initially believed could lower the work’s value. The Metropolitan Museum of Art owns a vase by the Kirkpatricks that is currently on view in the American wing of the museum. “A really good piece of Anna Pottery will usually bring in around $40,000 to $50,000”, says Zipp. He adds, “We knew this one was special because it’s so purely folk—it’s just not prissy in the slightest.” Crocker Farms also set the last auction record for a piece of Anna Pottery with the sale of another snake jug in 2014 bought by the Leeds Art Foundation for $87,400.